You're reading this article, so there's a good chance you've been doing some research on infrared saunas and what they have to offer. That means you probably already know about their health benefits and how infrared saunas compare to conventional steam saunas. Infrared saunas have plenty of advantages, but buying one to put in your home can get a bit expensive. Fortunately, a number of sauna kits are available, and they often make the cost of buying your own sauna more affordable. In fact, many people who are looking into kits are searching for cheaper alternatives than pre-built saunas. Most sauna kits are modular and designed for easy assembly. They include pre-fabricated, pre-fitted wood panels that are assembled to create the sauna room's walls and ceiling, several heaters (infrared emitters), heater guards, benches, backrests, a pre-hung wood or tempered safety glass door (the wooden doors often have a tempered glass window), and the control panel you'll need to operate your sauna. Some kits also come with some nice accessories, such as a headrest, a towel rack, a CD player or even a full-fledged music system. Naturally, the number of infrared heaters included in a kit will vary with the size of the sauna. Infrared heater kits are available in a variety of sizes, including single-person saunas as well as those designed to seat two, three, four or even five people. As the size of the finished sauna room gets larger, so does the number of infrared emitters that will be included in the kit that makes it. Additional heaters and advanced electronic control panels are two of the most popular extra-cost options for infrared sauna kits. The kits are designed to be easy to assemble, and because no hot water or steam is involved with an infrared sauna, you can put one just about anywhere in your home that space permits (assuming the space has a hard, flat floor and electrical service). It is, however, strongly recommended that you have a qualified electrician wire in the heaters, control box and lights. It's very important to make sure the infrared sauna kit you choose only includes materials that are non-toxic. For example, you don't want your sauna's walls and ceiling made from wood that was damp when it was shipped, because that means the wood panels had to be sprayed with chemical fungicides to deter mold and mildew. Although you don't want a moldy sauna, you also don't want to be breathing those toxic chemicals every time you're relaxing in your new infrared sauna. You also don't want to buy an infrared sauna kit that uses MDF (the initials for medium-density fiberboard). Why not, you might ask? After all, fiberboard is a pretty common construction material. Well, unfortunately, MDF is made with all types of glues and adhesives, some of which can be pretty nasty to inhale once they're heated and start emitting gases. And isn't heating what an infrared sauna is designed to do? Some MDF is made with formaldehyde, which can be even worse. Exposure to even tiny amounts of formaldehyde can cause serious long term health problems. 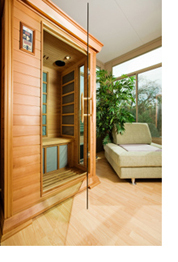 Many infrared sauna kits include an electronic control box. They often feature an attractive, easy to use LED display, silent operation and a time delay setting. Make sure the sauna kit you buy also includes a child-safe lockout if you have kids or if children ever visit your home. You'll also want a good music system in your kit. There's nothing more relaxing than sitting in your own sauna, listening to your favorite music while you're sweating out the toxins in your body. Infrared sauna kits can be quite economical when you compare their price to the cost of buying a fully-assembled sauna. When you're trying to decide on the supplier you'll buy from, it's important to find one that will ship you an infrared sauna kit that either meets or exceeds all the points we've mentioned in this article. Once you find the right supplier, you'll be able to relax and enjoy your home sauna long into the future. To the top of "infrared sauna kits"